Win Murder On The Orient Express: Jump on board for Agatha Christie's timeless classic | SWITCH. Kenneth Branagh directs and leads an all-star cast, including Johnny Depp, Michelle Pfeiffer, Penélope Cruz, Judi Dench and Leslie Odom, Jr, in this stylish, suspenseful and thrilling mystery based on the best-selling novel by Agatha Christie. Everyone’s a suspect when a murder is committed on a lavish train ride, and a brilliant detective must race against time to solve the puzzle before the killer strikes again. 'Murder On The Orient Express' is a timeless classic that “will keep audiences guessing” (Peter Debruge, Variety). 'Murder On The Orient Express' is loaded with bonus material that dives into the making of the film including an eight-part documentary, eleven deleted scenes, commentary by Branagh and much more. The 'Murder On The Orient Express' competition has now closed. Winners will be announced shortly. Competition opens at 5pm AEDT on Sunday 18th March 2018 and closes at 11:59pm AEDT on Sunday 25th March 2018. Five winners will be chosen at random on Monday 26th March 2018. To successfully win, entrants must fulfil the above entry conditions before the time the competition closes. Current members/followers are eligible to enter the competition. Only one entry per person. Only one winner per household. To be a valid winner, the entrant must not have won a prize from SWITCH within the last 28 days. Each winner will receive one Blu-ray copy of 'Murder On The Orient Express'. By entering, you agree to receive occasional emails from SWITCH in the future. If you decide to unsubscribe from these updates, any further entries will not be applicable. Only Australian residents are eligible to enter. 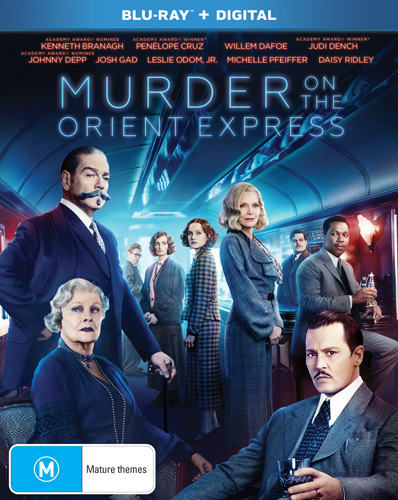 'Murder On The Orient Express' is available on 4K Ultra HD, Blu-ray, Digital and DVD on Wednesday the 21st March 2018 from Twentieth Century Fox Home Entertainment.